Speed definitely has a genetic component, but you can definitely enhance an athlete’s speed with proper training. In this post you will three strength training in drills designed to improve speed. former University of Maryland Strength Coach, discusses stride frequency and stride length and the role that fulfill in producing speed. He also offers three exercises that are designed to improve speed. While stride frequency ( how quickly your foot can strike the ground over and over) has a large genetic component, technique training can help to make that process more efficient. Stride length is how much distance that you cover and it is heavily influenced by training. Strength and power training can have a tremendous effect on an athlete’s stride length and thus his/her speed. This is done through resistance training. Whether it is in the weight room, using bands, running hills etc…. , strength and power training will increase your stride length and therefore your speed. 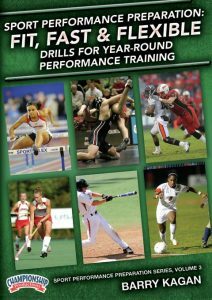 These exercises are taken from his DVD entitled Sport Performance Preparation: Fit, Fast & Flexible – Drills for Year-Round Performance Training. This video can offer year round preparation for multitudes of sports in ALL AREAS of Strength and Conditioning. For more information click the link above. The YouTube video below has audio, so please make sure that your volume is turned up and that you have access to the site. Note some schools block access to YouTube. If you are having trouble viewing from school, please contact you network administrator.